I've only tackled brisket once before. 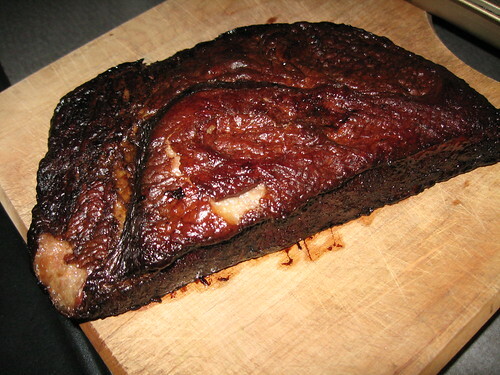 It was ok, but I gave it too much of a rub; a piece like this, doesn't need it. I did a combo cooking method that worked swimingly. A week ago or so it was really windy and about 18°F. Good day for barbecue I thought. I fired up my trusty Weber at about 5:30 am and tossed on the meat, fat side up of course, and let it smoke for about 5 hours using Kingsford embedded with hickory. Temp in the dome, about 275°F. A little erratic with the blustery wind but not bad. Suddenly, family matters dictated we needed to dash. I pulled the meat off since I didn't know how long we'd be away. I placed it in a small pan (and kept the smoky drippings for later!) and placed it in a 200°F oven (a la Wolfert's Slow Mediterranean Kitchen) and let it go for about an additional 6 hours. See the after pic. I wrapped the brisket in foil for and parked it in the fridge. Warmed gently a couple days later immediately reminded us of the wonderful 'q aroma, it was served with baked sweet potatoes. If I were on death row, this might be the final meal I request. I no longer fear the bbq challenge of brisket. Not a very expensive cut, BIG crowd pleaser, not too fatty by the time it's finished. 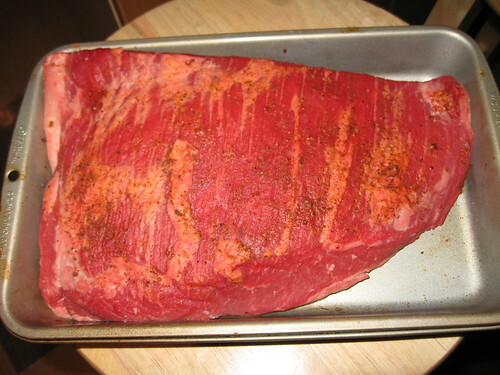 Be brave, bbq a brisket.